By Adam Spradling, Web Producer, Digital Designer and Blogger at The Blood-Horse. Do you know how to follow The Blood-Horse outside of our wonderful website? 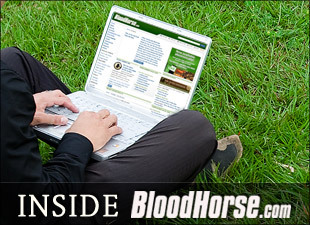 The news, features, video, images and blogs do not stop at the article level for us on BloodHorse.com. Our staff allows for further immersion and farther reach into our industry. Your first stop may want to be our Community page on BloodHorse.com. This is a one stop shop for a quick glance into our website community and social media platforms. Have you ever wondered why a comment was unapproved or deleted? Take a look at our Community Policy page. Follow and learn more everyday with our staff beyond the BloodHorse.com borders. Adam Spradling: Adam offers a fan vs insider view on the industry. Anne Eberhardt: Anne is our photographer and is amazing! She has recently started sharing her passion in exclusive photos in a unique photo blog format. @BH_MaidenWatch - Follow a select few first year Sires and their offspring. In depth and exciting. @TrueNicks - TrueNicks is a nicking product that provides very valuable pedigree information. Dede Biles: Dede covers many auctions around the world and has a deep well of knowledge to pull from. Esther Marr: Esther is a staff writer who loves the athletes in the horse industry and wants to give you behind the scenes access. Eric Mitchell: Eric provides excellent industry insight and commentary. Jason Shandler: Jason is a staff writer who knows the game. He can handicap or provide valuable insight into this fun industry. Scot Gillies: Scot is a staff member who is fascinated by pedigrees. Listen to what he has to say when you want your next champion. Stephanie Church: Equine health and welfare will never be the same with her team's coverage. Steve Haskin: Steve's knowledge on Thoroughbred racing is as close to as unlimited as you can get. Tom Hall: Tom is a staff member who has a data bank of history which he uses to explain our industry. He often follows horse sales from across the globe in his tweets. Tom Lamarra: Tom enjoys discussion about the state of the industry and those making decisions in it. We also include thoughts from people around the industry, outside of The Blood-Horse. For a full Blog listing, visit here. The Blood-Horse Page: Come join us on our page! We post special promotions, sometimes unique to Facebook, blogs, video and other content here. We typically do not use our Facebook profile, due to the friend limitations. Living a mobile life style? These may help. RSS Feeds: You can plug this feed into your Yahoo or Google accounts to see a stream of our news.